DTV Group formed in the 1980's to support undergraduate video production and television distribution at Brown University (BTV) and Harvard University (HRTV). We helped to build multi-camera switched video studio facilities for both universities. We also built Quad Sound Studios, an eight-track analog recording studio for Harvard undergraduates to create recordings for their music portfolios. In 1988, DTV Group Director Bob Doyle helped Matt and Patrice York launch Videomaker Magazine. Matt had been a Super8 Sound customer and noted that when Super8 Filmaker magazine was launched there were a few hundred thousand Super8 film cameras, but there was as yet no magazine for videomakers despite over a million video cameras sold. In the early 1990's the DTV Group was loosely associated with the Boston Computer Society New Media Group. DTV Group director Bob Doyle wrote articles for the BCS New Media News. The name "Desktop" Video was chosen by analogy with Desktop Publishing (DTP). 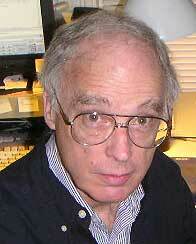 Bob Doyle had written the first DTP program, MacPublisher, in 1984, the year of the Apple Macintosh introduction. Bob was the eleventh certified Macintosh developer. 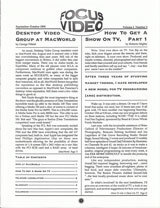 The proposal accepted by Apple was to build a color video title generator called MacVideo. Instead, Bob, his son Rob, who had just graduated from Commonwealth School, and his wife Holly wrote the first page layout program for Macintosh. In 1992, Bob asked Matt York to let him write for Videomaker. Over the next two years he wrote several columns on Desktop Video and a cover feature on four-camera multi-track post-production editing. 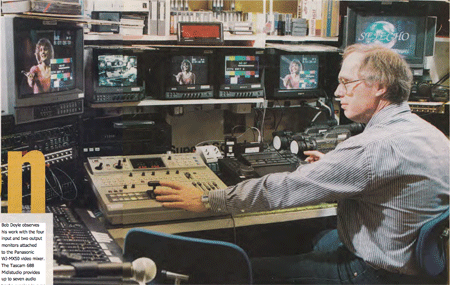 Bob with the Panasonic WJ-MX50 4-input switcher and synchronized Hi-8 camcorders. This was a forerunner of today's 6-camera iTV-Studio designed by Bob, which puts an ATEM Television Studio switcher, a 20" television monitor with a multiview screen, a touchscreen laptop computer, a wireless access point, and an internet broadcasting appliance, in a portable rollabout case that fits under an airline seat. A Hi-8 Users group met regularly at DTV Group, featuring video screenings by Richard Leacock. Meetings reported on the state of the art in camcorders. Members did research on analog video editing and synchronizing multiple Hi-8 camcorders. The Hi-8 Users group published a bi-monthly Focus Hi-8 newsletter edited by George Fifield and David Lawrence. It was sponsored by Newtonville Camera and included a calendar of local events. 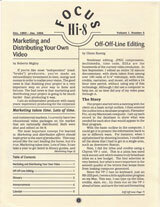 The newsletter featured a Video Glossary by Bill Whalen. 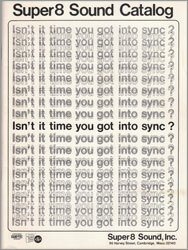 The Hi-8 Users group was merged into DTV Group in 1994 and the newsletter was renamed Focus Video. It ran articles by Bob Doyle, Richard Leacock, Roberto Mighty, Peter Pinch, Jim Ritscher, Michael Sheridan, and Tim Wright. In 1994 DTV Group's labs in Cambridge became the home of NewMedia Lab , doing digital video testing of hardware and software for NewMedia magazine from 1994 to 1999. 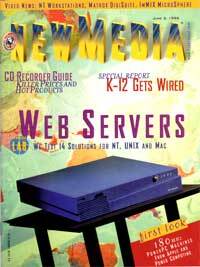 Bob Doyle, the first director, and Jeff Sauer, the second director of NewMedia Lab, wrote many articles for NewMedia Magazine on DV camcorders, non-linear editing systems, video hard drives, multimedia projectors, and dynamic web publishing systems. Bob and Jeff developed a diagnostic test tape to evaluate the performance of video capture cards that converted analog video to digital. They tested 18 PC capture cards and Bob wrote the 14-page article Windows Video Capture Cards with the help of several DTV Group members. Bob and Jeff prepared the feature table and supervised testing by Mike Bergman, Ted Carroll, Leo Cierpial, Peter Pinch, Will Martins, Peter Stassa and other Desktop Video Group members. Bob and his son Derek Doyle converted the NewMedia Lab article into a NewMedia Lab/DTV Group CD-ROM with the results of the capture tests, a comparison of various compression codecs, and a tutorial on digital video. In 1995 came the introduction of the MiniDV digital video format and Apple's FireWire for noise-free transfer to a desktop video editor. Analog camcorders were obsolete, capture cards no longer necessary, and all the compression schemes were replaced by the MPEG-2 based DV format. The DTV Group helped Bob do a roundup of 13 DV camcorders from the $23,000 Sony DSR-130 to the tiniest JVC GR-DV1. It marked the end of analog camcorders for professional work. 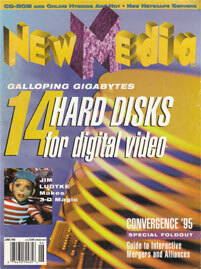 The study produced an 11-page article for NewMedia entitled "Shooting Stars: A Digital Video Revolution". 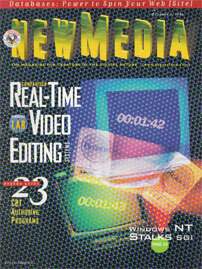 The Desktop Video Group helped do the testing for other cover stories like "Hard Drives for Digital Video" in 1995 and "Real-Time Video Editing" in 1996. 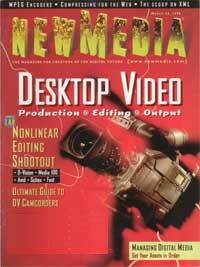 "Desktop Video" was the main theme of a whole issue of NewMedia magazine that was distributed widely at the 1998 National Association of Broadcasters (NAB) show. In 1997, Mike Jittlov, the acclaimed stop-action animator of The Wizard of Speed and Time was in residence at Desktop Video Group studying digital video editing and animation tools. DTV Group arranged and videotaped Jittlov presentations of his films at Northeastern, MIT, and Harvard for Jittlov's hundreds of fans in the Boston area. In 1998, DTV Group member Matt McMakin experimented with digital video webcasting and assisted Harvard University Extension School to post the University's first distance-learning class on the web. Also in 1998, Steven Ascher and his wife Jeanne Jordan studied non-linear digital video editing at DTV Group as Steve was producing the 1999 edition of his classic Filmmaker's Handbook. DTV Group provided technical, logistic, and financial support to many individuals and media groups in the Boston area, including the Boston Cyberarts Festival, Boston Film/Video Foundation, Cambridge Community Television, Quad Sound Studios, Harvard Radcliffe Television, and Massachusetts College of Art. As multimedia and CD-ROM production declined toward the end of the 'nineties, Bob's attention turned to the world-wide-web. 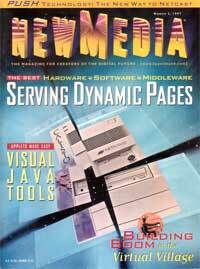 He wrote cover stories for NewMedia on "Web Servers" and "Serving Dynamic Pages." These were co-authored with DTV Group members Sam Murphy and Derek Doyle. The interests of many Desktop Video Group members turned to web video. Bob and Derek Doyle turned their attention to community collaboration tools as they founded skyBuilders.com. Their vision is an online "community computer" or CC - the next step beyond the personal computer or PC - which can hold the complete "institutional memory" of an organization, including all its digital video, audio, and animation files. 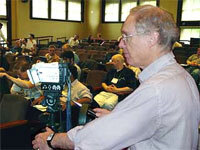 In 2003, DTV Group collaborated with Professor Charlie Nesson of the Berkman Center to send video production tools to Jamaica. skyBuilders also sent web servers with their "timeLines" information management software. DTV Group member David Pearson, executive director of Shawmut Education carried the computers and MiniDV video production gear to Jamaica. While there he met with the Ministers of Education and Technology and he trained dozens of Jamaicans. 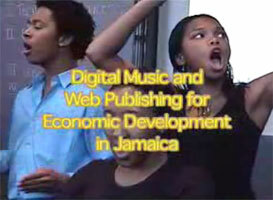 Bob Doyle, David Pearson, and Jamaican filmmaker Barbara Blake-Hannah collaborated on a 25-minute film on Digital Music and Web Publishing in Jamaica describing the Harvard work in Jamaica. It is available on YouTube. In 2003, DTV Group recorded the OSCOM and Bloggercon conferences at the Harvard Law School Berkman Center for Internet and Society and published them as web video. Former NPR talk-show host Christopher Lydon came to DTV Group to learn to make his own shows and publish them to the web. Chris produced fifty interviews in our lab which were published to his Harvard blog. Later they became known as the "first podcasts." Our Blog Audio and Blog Video websites describe the technology developed by DTV Group, including Chris Lydon's Portable Studio. Including the OSCOM and Bloggercon conferences at Harvard, DTV Group has recorded over 80 hours of videos at conferences on content management and structured publishing for CMS Review, who published them to the web. 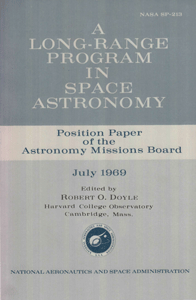 The Desktop Video Group Director, Bob Doyle, and his wife Holly, earned Ph.D's in Astrophysics from Harvard University in 1968. Anti-nepotism rules prevented them from getting academic positions in the same university (long since eliminated by the rise of feminism). Bob decided to become an entrepreneur in the hopes of earning an independent income so he and Holly could remain in Cambridge near Harvard. There Bob could pursue a lifelong interest in some great problems in philosophy, using the resources of Harvard's excellent libraries. Bob was the secretary of NASA's Astronomy Missions Board from 1968 to 1972. He edited A Long-Range Program in Space Astronomy, which NASA submitted to Congress, leading to the launch of the High Energy Astronomical Observatory satellites and subsequently the Einstein and Chandra missions. He coordinated the Joint Observing Program for the Skylab astronauts from 1973 to 1974, which helped 250 astronomical observatories around the world synchronize their ground-based observations with those made by the Skylab astronauts with the Apollo Telescope Mount on board Skylab. From 1973 to 1978, Bob was the CEO of Super8 Sound, where he pioneered double-system synchronous sound recording and editing for Super8 Professionals. As a full member of the sound engineering committee of the Society of Motion Picture and Television Engineers, Bob helped specify standards for digital synchronization signals between Super-8 film cameras, cassette tape recorders, and the Super8 Sound fullcoat magnetic film recorder. The Super8 Sound Catalog became the definitive equipment reference for Super8 filmmakers. It went through three editions with an average circulation of 15,000 copies. Hollywood's American Cinematographer magazine devoted the November 1975 issue to Professional Super 8 tools and techniques developed by Super8 Sound. The legacy of Super8 Sound continues with worldwide support for the Super8 medium at Phil and Rhonda Vigeant's Pro8mm in California. Phil is "the man who saved Super8" and one of Super8 Sound's first employees.